Factory Direct Doors | Vancouver, BC Wood doors, french doors, panel doors, metal doors, and fiberglass doors for Residential and Commercial. Factory Direct Doors is your specialty residential door source, providing expertise and quality product from our local Richmond, BC, custom manufacturing shop. What sets us apart is our ability to say "Yes." Contractors, homeowners, and architects love that they can trust Factory Direct Doors to provide all their door solutions. Our wide range of product makes us unique; not only do we have the capability to build custom doors, we also stock thousands of factory overstock doors in multiple warehouses, and import doors from around the world. Contractors love that we can supply everything from a high end solid fir Eclipse bifolding door unit, to a half-price door for his garage or basement. Our range of solutions at every price point guarantees we always have the best value. Our custom doors are pieces of art worthy of admiring with friends over a glass of wine. Hand-built by our craftsmen in our shop in Richmond, BC, our quality Douglas fir doors are sought after throughout Vancouver, the North Shore, Whistler, BC and Alberta. Choose vertical grain fir for it's eponymous West Coast reputation, or any species from oak to walnut, to perfectly compliment your modern, heritage, or traditional style project. Our clients say our knowledgeable interior designers make doors the easiest part of their renovation or new construction projects. We are the only door company with a team of qualified interior designers; the attention to detail is unmatched. Our team can read blueprints, provide CAD drawings, offer design expertise and have a genuine interest in the finished project. We are invaluable support on site, and have a special understanding of the West Side of Vancouver. We encourage you to give us a call so our door experts can provide you further information and assistance through the project, at 1-888-238-2687. 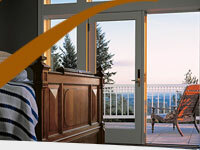 Availability of product is only the beginning when it comes to customer service at Factory Direct Doors. Quality of product, accuracy in order entry, punctual production control, perfection in assembly, detail in quality control, and exceptional customer satifaction is always the goal.